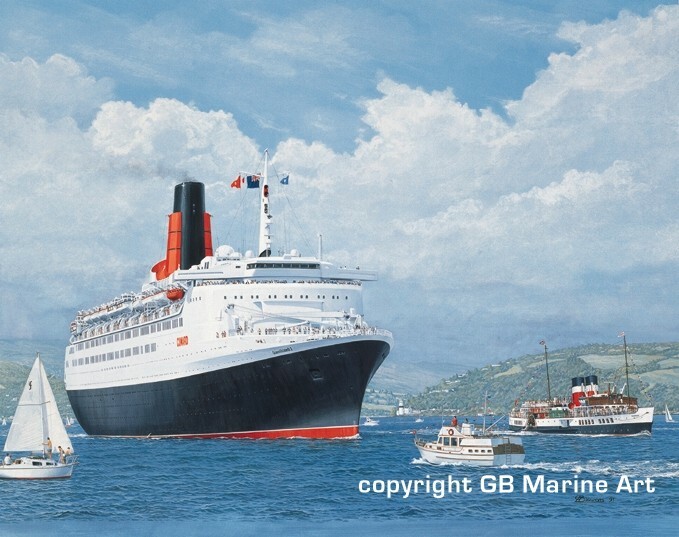 As part of their 150th Anniversary celebrations in 1990, Cunard scheduled their flagship, Queen Elizabeth 2, to visit Greenock on the River Clyde. This was a pilgrimage to the waters which bore QE2 and so many of her famous Cunard predecessors to the world. In appreciation of this moving tribute, an estimated 200,000 admirers lined strategic points along the Lower Clyde to gaze in awe at this majestic reminder of the River's one-time shipbuilding supremacy. Many suspected that, as this was QE2's first visit to her roots since the late 1960s, it may have also proved to be her last. Not surprisingly, emotions ran high, not least for those who had been involved in her construction at the famous John Brown Shipyard in Clydebank. At the end of her brief stay, the mighty liner eased from her Greenock berth with three soulful farewell blasts on her deep siren. 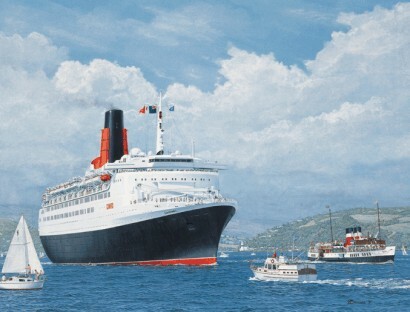 Shortly after, QE2 was joined by the world's last sea-going paddle steamer, Waverley. Accompanied by a swarm of little craft, the distinguished pair presented an unforgetable sight as they passed the famous Cloch lighthouse and headed out into the sunny haze of the beautiful Firth of Clyde. Limited edition of 750 individually signed and numbered fine art prints.